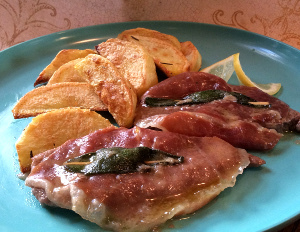 The literal translation of saltimbocca is “jump in the mouth”. Roman saltimbocca veal escalopes are famous all over the world. Why all the fuss over such a simple and quick recipe? Because although the dish is simple to prepare, saltimbocca is incredibly flavourful, a perfect combination of meat, ham, wine, and sage. It also pairs well with many different vegetables. For example, add some roasted potatoes (recipe below) and you have an elegant dinner suitable for any occasion. Saltimbocca is one of the most classic of all Roman dishes. 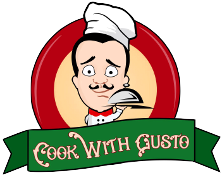 They are traditionally prepared with veal meat but many variations exist. Sometimes the saltimbocca is cooked rolled up, although most recipes call for thinly sliced meat, which guarantees greater browning surface and faster cooking. 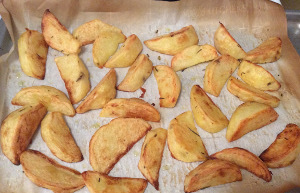 Ingredients for oven-roasted potatoes, instructions here following. Cut the beef escalopes into 2 halves to get 6 pieces. 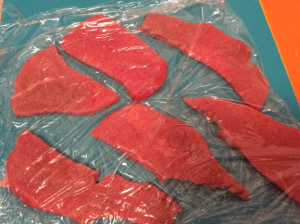 Place the beef escalopes on a chopping board, cover with clingfilm and, using a meat tenderizer or a rolling pin, pound them until they are about 5mm thick. Discard the clingfilm. Dredge each escalope in the flour and shake off excess flour. This will help achieve a thicker cooking base. Cut the prosciutto slices into 2 halves to get 6 pieces. 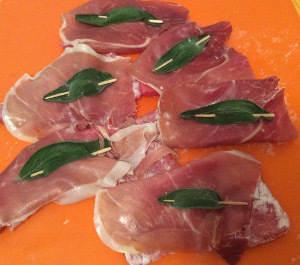 Using a toothpick, secure a slice of prosciutto and a sage leaf on top of each escalope. Place the butter and olive oil in a 12-inch skillet and melt over medium-high heat. Then add 6 escalopes, prosciutto-side down, into the pan. Cook about 1 minute on each side, until golden brown. Remove the escalopes, place them on a plate, and cover with foil to keep warm. Put the pan back on the heat, add the white wine and simmer for 1 minute until you have a shiny sauce. 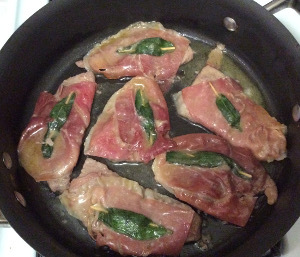 Put saltimbocca back in the pan, mix with the sauce and cook for an additional 2 minutes. 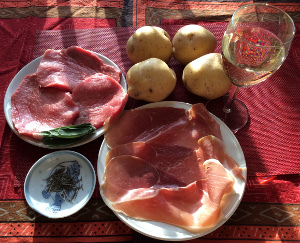 Season with pepper to taste and remove from the heat (there is no need for salt as the prosciutto is quite salty). 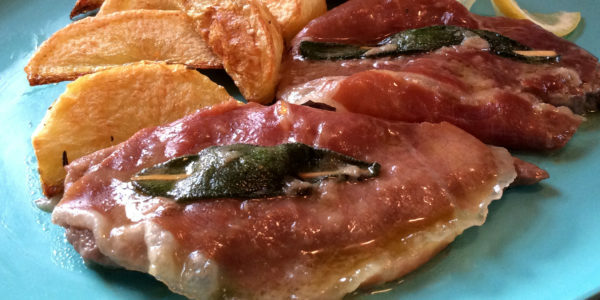 Serve the saltimbocca as a second course with roasted potatoes, and a mixed salad or other vegetable. Baked potatoes are a perfect side dish that both adults and children love. There are some little tricks to prepare them in a tasty way. 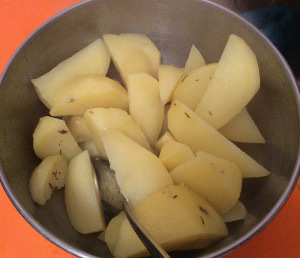 Pre-cooking potatoes in water will make them crunchy outside and soft inside. The scent of rosemary and extra virgin olive oil will help you to get a mouthwatering taste. With a few simple ingredients and a little of cooking technique, you will get a perfect and healthy dish. 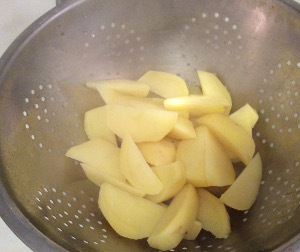 Peel potatoes and cut vertically, into large slices. 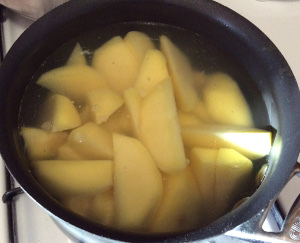 Put potatoes into boiling water at medium heat for about 3 minutes. 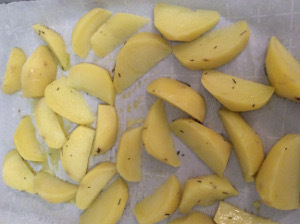 Add salt, rosemary, extra virgin olive oil, to the potatoes, and mix. Line a pan with parchment paper and arrange the slices in the pan in one layer. After 15 minutes open the oven, check for doneness with a fork and turn upside down. Bake potatoes at 180 degrees for an additional 15 minutes until lightly browned.